A Vogel Cranberry Complex contains extract of cranberry with nasturtium, horseradish and golden rod. Each tablet of this cranberry supplement contains the equivalent of 7.5g of fresh cranberries, as well as extracts of freshly harvested nasturtium, horseradish root, golden rod and bergamot. Vaccinium macrocarpon (cranberry) powder (equivalent to 7.5 g of fresh cranberries). 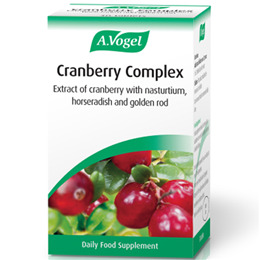 Below are reviews of A Vogel Cranberry Complex - 30 Tablets by bodykind customers. If you have tried this product we'd love to hear what you think so please leave a review.